Lowdown: A guy replaces his best friend's sperm donation with his. I may as well say it: Why? As in, why do I bother watching Hollywood romantic comedies anymore when they are so predictable, so “seen one, seen them all”? 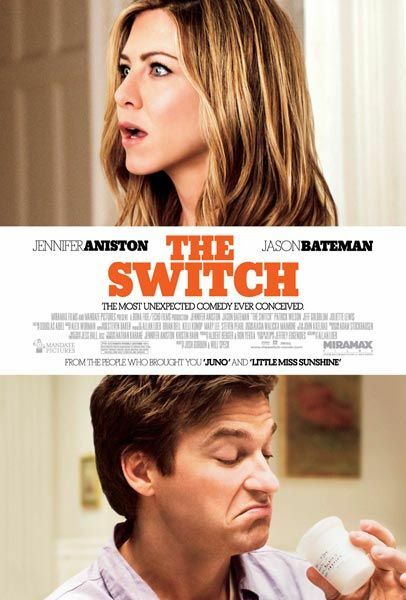 Case in point: The Switch (2010). Wally (Jason Bateman) and Kassie (Jennifer Aniston) are best mates. As much as a man and a woman whose relationship started out through romance that got clipped after two dates can be best friends; clearly, Wally aspires for more than Kassie would relinquish. As my old saying goes, if I had a plane for every time I heard the dreaded “let’s just be friends”, I’d be a national airline. Maybe not American Airlines, but Qantas? Sure. With New York life being the way it is, Kassie finds it hard to find a male partner. At the same time, her biological clock is ticking. She decides to try and get pregnant using a donor's sperm, and arranges a party for her friends where she would attempt conception. The Switch ignores conception being a matter most people would rather keep for themselves, but rather uses the scene for some comedy. A drunk (or was he drugged?) Wally finds himself in the same room as the sperm donation; one thing leads to another and the donation is spilled. What can a man do? Provide a replacement, of course. A switch. Next thing we know, Wally wakes up without a clue as to what happened last night. Kassie gets pregnant and moves away from New York's hectic scene to focus on her single parenting. Fast forward a few years when Kassie returns to New York, with her child, for things to unravel. And if by now you do not know how this movie will develop then, my friend, you are naive. There really isn't much more to say about The Switch other than point at its actors. They do a fine job keeping this movie alive by doing the exact thing they have been doing since Friends and Arrested Development. Helping them along are the respective best friends on each side: Juliette Lewis on Kassie's side, and Jeff Goldblum on Wally's. Overall: An hour and a half of easiest entertainment. 2.5 out of 5 stars.